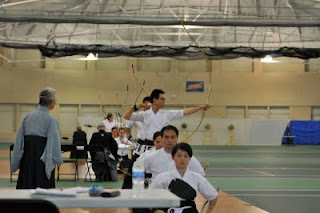 2011 AKR Seminar Report from President Yoshiko Buchanan | The Kyudo Project Blog! 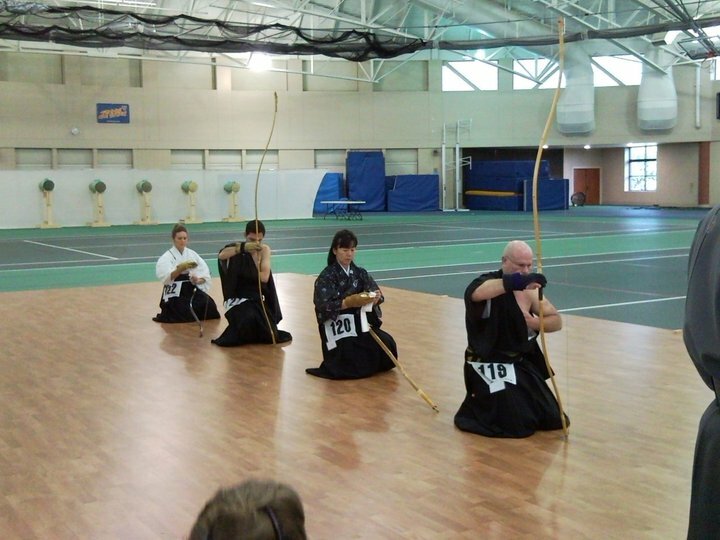 The 2011 American Kyudo Seminar took place at Carleton College, in Northfield, Minnesota from the 1st to the 5th of August, 2011. It is my pleasure to have this opportunity to talk about the 2011 American Kyudo Seminar. First of all I would like to express my special thanks to Carly Born, Renshi Godan and MNKR president, and John Born, the MC and the Dojo Manager. I would also like to extend my great appreciation to the entire Minnesota Kyudo Renmei that was the 2011 host federation. Many MNKR members, friends, college teachers and family members provided their best efforts to make this seminar successful. Of course, many AKR members assisted and cooperated with the host. Their contributions certainly supported the host to make the seminar successful. A great part of their work was the construction of three beautiful Shajo, with smooth wood floors. Their efforts created works of art. Such Shajo and the Azuchi with Maku impressed all participants and the teachers. The teachers could teach correct movements with the correct speed and rhythm. There was excellent translation given throughout the seminar by Earl Hartman, Renshi Rokudan/NCKF, and other assisting translators, for which I am deeply grateful. It is also my pleasure to share with you that I received a thank you note from the three teachers and Suguru Asami (from the ANKF office). They expressed their gratefulness to the efforts of the MNKR and the lovely hospitality that they received from the MNKR and the AKR. SPECIAL SEMINAR (August 1st): The basic seminar program was presented by the AKR and Iijima sensei, the chief instructor, modified it. The “Special Seminar” was for Yondan and above participants. The opening Rei was led by Iijima sensei (for the entire seminar). Raiki Shagi / Shahokun recitation was led by Mie Takahashi (Toronto/Canada). The 28 participants received instruction (Kihontai, Hadanugi/Hadaire, Tasukisabaki during the morning and shooting technique in the afternoon) from the three teachers, which was quite a luxurious teacher to student ratio (almost 9:1). The lecture “The Attitude and Responsibilities of an Instructor” was given by Iijima sensei. 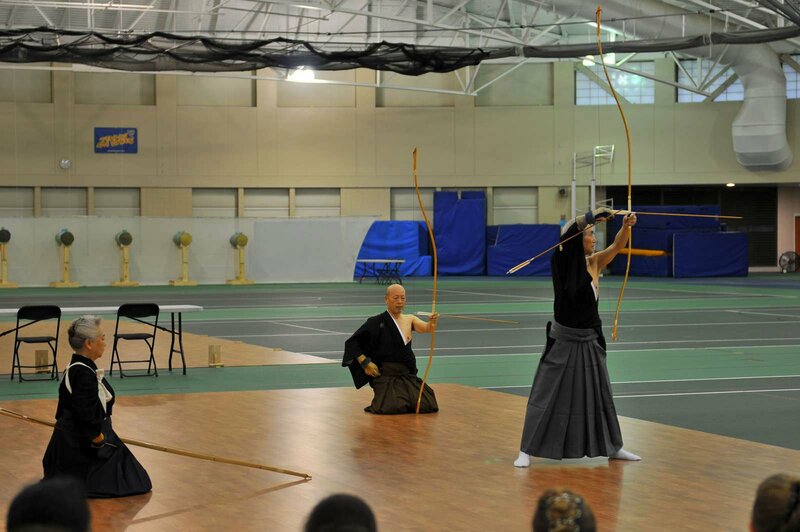 We have been told to use Japanese Kyudo terms regularly in our daily practice. DAY 1 (August 2nd): The 2nd day of the entire program was, in fact, the first day of the regular seminar. 135 participants from five countries (Argentina, Brazil, Canada, Mexico, and U.S.A.) gathered. Raiki Shagi / Shahokun recitation was led by Reiko Blackwell (SCKR). Instead of Yawatashi the three senseis performed Hitotsumato Sharei and all the students did Mitorigeiko. 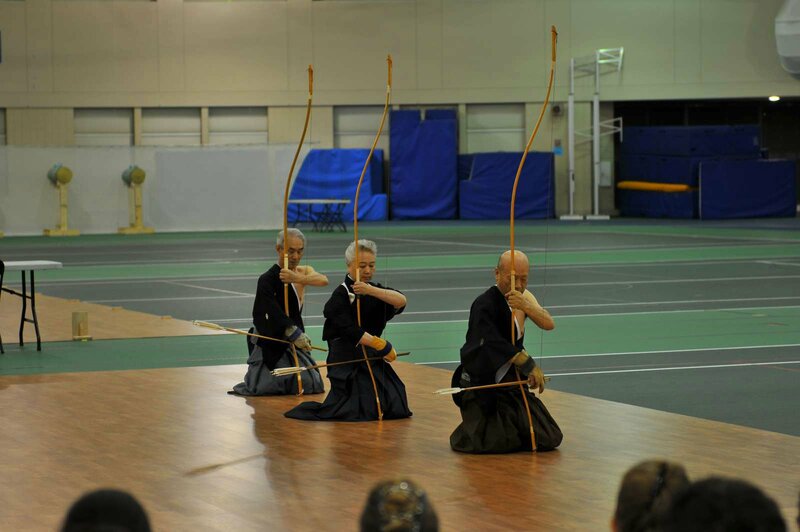 Before the participants began shooting, a lecture about Kyudo equipment was given by the teachers. Wrong Tsuruwa, Nigirikawa and Nakajikake were picked up by the teachers and the owner of the bow and his group were instructed in ways to correct the problem. The Day 1 instruction was focused on shooting technique to all the participants. However, Sharei study was given to the senior students of the special seminar group. The Daiichi Shajo was taught by Kubota sensei, Daini Shajo by Satake sensei and Daisan Shajo by Iijima sensei. 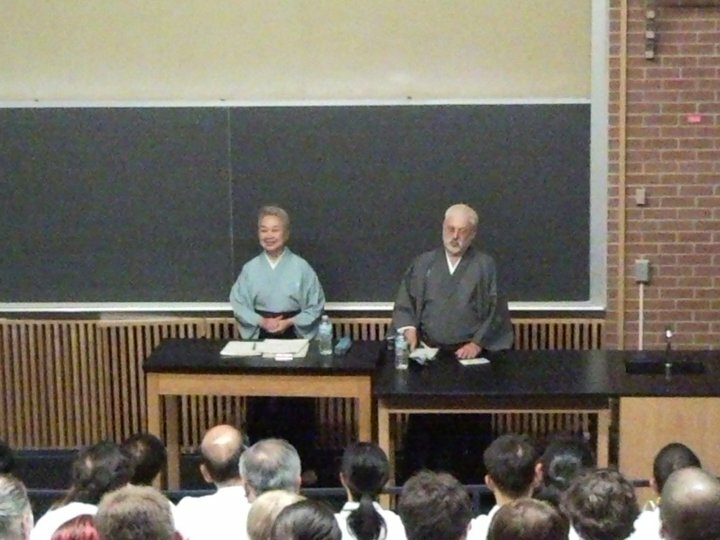 The three senseis rotated the dojo everyday and taught each group one day during the regular seminar. DAY 2 (August 3rd): Raiki Shagi / Shahokun recitation was led by Miho Ohyasu (NCKF). Mochimato Sharei was demonstrated by the senior group students instead of Yawatashi at the three Shajos and the evaluation was given by the Shajo teachers. Shooting technique study continued along with Kihontai, entering and exiting the dojo. Overall on Taihai the slow movement was pointed out to all the students. Kaizoe was studied among the senior students. The basics of Shitsu no Shori was taught by Kubota sensei to all the students and the lecture of the Day 2 was “Rei in Budo” by Satake sensei at the lecture room. Satake sensei spoke about the historical flow of Yumi (Kyudo) and extended her thoughts of “On (Obligation or debt)“ that we owe from our parents and also our teachers. In the evening a friendly banquet was given inviting the teachers, Dean Nagel and other dedicated people to the seminar. DAY 3 (August 4th): Raiki Shagi / Shahokun recitation was led by Junko Kurita (NCKF). Hitotsumato Sharei was demonstrated by the senior group students at the three Shajos and the evaluation was given by the Shajo teachers. The shooting practice continued at the Daiichi and Daini Shajo and more Sharei practice continued at the Daisan Shajo. 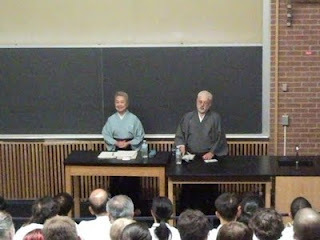 The 3rd day lecture was “How to read and use the Hassetsu chart” by Kubota sensei. He explained the critical area of the chart that we should understand correctly. In the early afternoon test shooting was rehearsed at each Shajo. 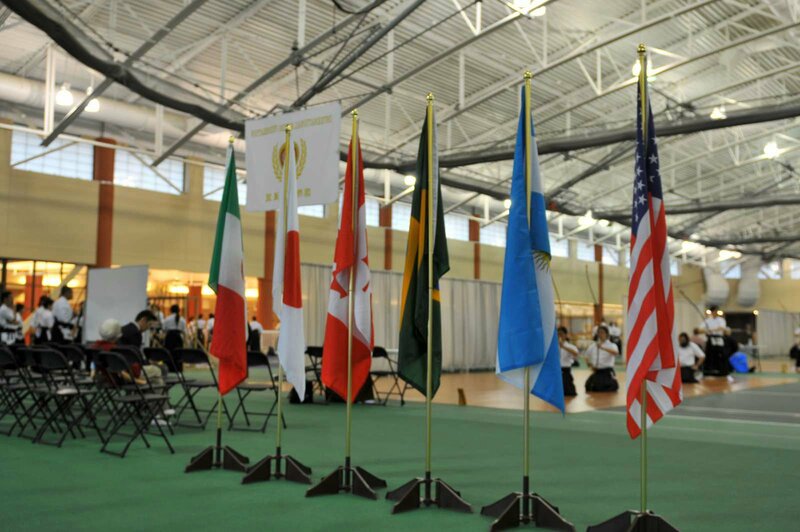 The 2011 American Kyudo Seminar was closed with a thank you speech by Carly Born representing the host federation and the AKR. The seminar certificates were handed to the students. The 2011 Andrew West award was awarded to Patrick Suen (now Shodan / Toronto, Canada). The 2011 AKR tournament took place on the 2nd of August. The tournament coordinator was Maria Peterson, Renshi Rokudan /NCKF. Both Iijima sensei and Kubota sensei stopped by to observe and gave us practical advice to run such a tournament in the limited time. His advice was certainly forwarded to the tournament coordinator and I hope it will be used accordingly. 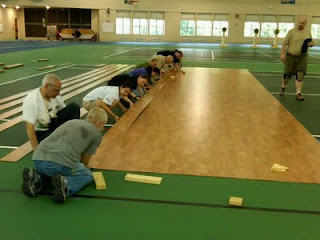 The AKR 2011 tournament was completed successfully and safely the evening of August 2, 2011. We had 72 participants (the largest AKR tournament ever!) and were divided into 3 Shajo. We started at 7:00pm, finished closing Rei by 8:50pm, and exited the Rec Center at 9:03pm, just 3 minutes over our allotted time. Both because of the strict time limit for the tournament, imposed by the College facility, and because we wanted to allow as many seminar attendees to participate in the tournament as possible, we modified the standard tournament timing to "kai-uchiokoshi" timing. This meant that everything moved along pretty quickly. We also eliminated Yawatashi performance, and for tie-breaking, we eliminated the izume in favor of enkin in the interest of time. Most people thouroughly enjoyed the tournament experience, and I extend my sincere thanks to the dojo assistants and target judges that kept us on track with the fast tournament timing pace. A few participants seemed uncomfortable with the quick pace. To those who found the timing uncomfortable, please practice tournament timing in your home dojo as often as possible. Try standard tournament timing; also, try kai-uchiokoshi timing. There are times when the situation of the event demands that we keep to a strict time schedule, and we need to be able to maintain Heijoshin (everyday mind) even under pressure. Congratulations to those that achieved the highest number of hits in the tournament! The winners were awarded with gift certificates to be spent at the Kyudo equipment vendors, Sambu or Takahashi, that were present at the AKR 2011 seminar. Gift certificates were $25 (1st place), $15 (2nd place), and $10 (3rd place) for each of A group and B group winners. Thank you to everyone for your sincere support for the tournament, especially the dojo assistants (Yoshiko Buchanan sensei, Eric Kong, Miho Oyasu, Rik Center), the target judges (Steve Scott sensei, Daniel Kim, Andrew Platzer, Bill Reid), the MNKR and the AKR. 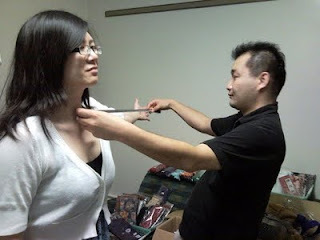 Since Mr. Asami from the ANKF office was there, the 2011 “American Seminar” Special Foreign Examination was very professionally announced and operated. 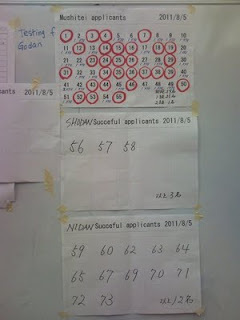 Thank you very much for your help with the testing at the 2011 seminar. Your help made it a successful event. The opening Yawatashi was performed by Iijima Masao sensei (Hanshi Hachidan) assisted by Earl Hartman (Renshi Rokudan/Daiichi kaizoe) and Maria Peterson (Renshi Rokudan/Daini kaizoe). 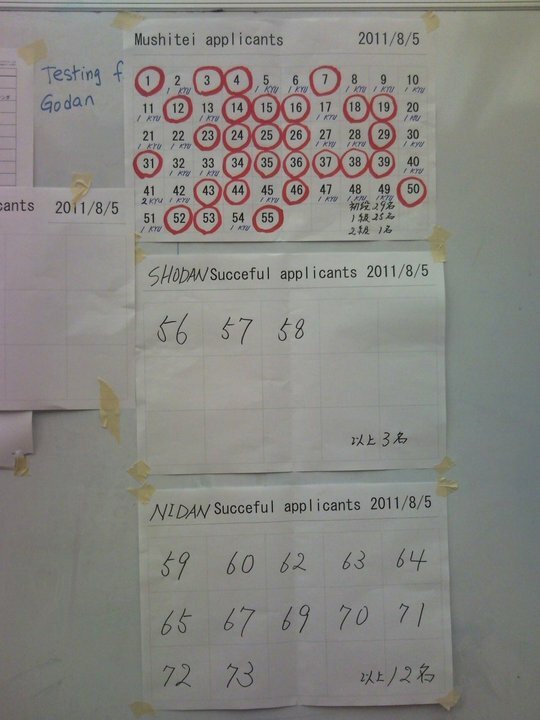 Nikyu 1 Testing Mushitei and testing Shodan were 58. 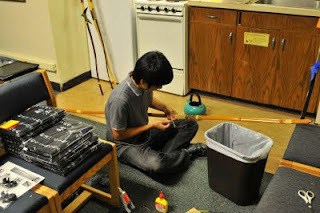 Nidan 12 Testing Nidan was 15. Sandan 3 Testing Sandan was 13. Yondan 2 Testing Yondan was 18. Godan 2 Testing Godan was 10. Renshi 0 Testing Renshi was 6. 1. 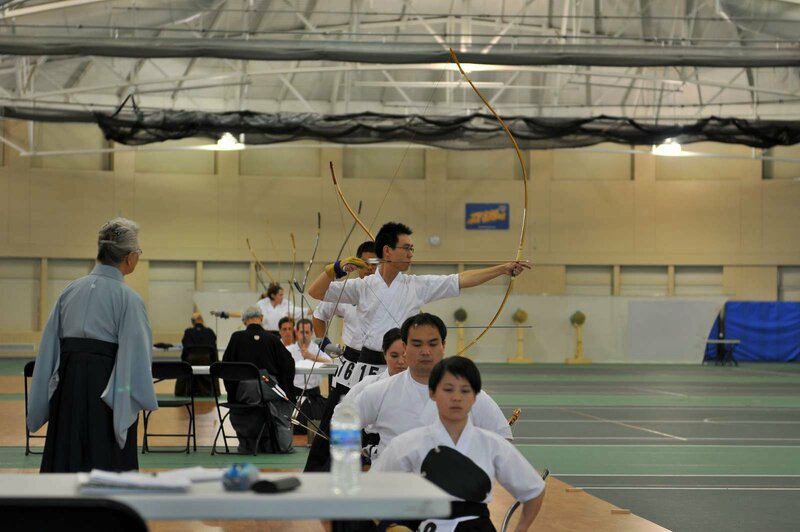 What made you start Kyudo? 1) “I said, ’Watch carefully ‘ but they do not watch. There are some sensei wishes. The sensei’s are truly wishing that all of us practice WHAT WAS TAUGHT DURING THE SEMINAR, continuous practice and to see improvement at the next seminar. Beside the four-day seminar the IKYF meeting and the annual AKR General Meeting were held. The minutes of those two meetings have been completed and should be available with the AKR secretary, Jannette Curran. This seminar was the first time the ANKF officially sent an inquiry to the AKR to invite equipment vendors from Japan. Unfortunately, an American vendor, Mr. Don Symanski, was not one of the vendors invited. Hopefully in future seminars we hope to invite him to a seminar. This method of going through the Japanese kyugu association to invite vendors should be maintained to be fair and provide an opportunity to all Japanese vendors who may wish to come. The two vendors were: Sambu Kyuguten from Chiba prefecture and Takahashi Kyuguten from Kumamoto. Both were very helpful in construction of the dojo and, of course, handling equipment problems and providing advice to the seminar participants. They enjoyed the seminar and wish to come back. In closing I’m afraid that I cannot report everything that happened or that I wanted to include; such as comments and feedback from the participants. But I would be happy to hear those comments. Feel free to send your impressions and comments about the seminar to me as feedback to improve future seminars. see you in Northern California in 2012! Group shot at Shiseikan's 20th anniversary party!